The Pittsburgh Penguins have re-signed goaltender Brad Thiessen to a one-year contract, it was announced today by executive vice president and general manager Ray Shero. Thiessen’s contract is a two-way deal worth $525,000 at the NHL level. 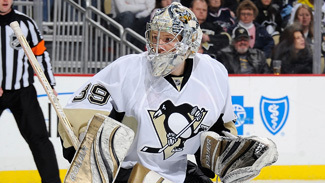 Thiessen, 26, split the 2011-12 season between Pittsburgh and Wilkes-Barre/Scranton of the American Hockey League (AHL). He made his NHL debut on Feb. 26 against Columbus, stopping 22 of 24 shots to earn his first NHL win. In five NHL games, Thiessen posted a 3-1 record. A native of Aldergrove, British Columbia, Thiessen made 41 appearances with WBS in ’11-12, going 23-15-2 with a 2.82 goals-against average. Thiessen’s best work came in the postseason, when he went 6-6 while ranking sixth in the AHL with a 2.14 goals-against average and posting a .908 save percentage. The 6-foot, 180-pound Thiessen had a career year with WBS in 2010-11, leading the AHL and establishing WBS franchise records with 35 victories and seven shutouts in 46 games. In total, Thiessen posted a 35-8-1 record, 1.94 goals-against average and a .922 save percentage, earning him the Aldege “Baz” Bastien Memorial Award as the AHL’s top goaltender. Thiessen and his crease partner, John Curry, shared the Harry “Hap” Holmes Memorial Award as the duo that allowed the fewest regular-season goals (183) in the AHL. Thiessen, who signed with the Pittsburgh organization as an undrafted free agent on April 8, 2009, has appeared in 117 career AHL regular-season games for WBS, going 72-37-4 with a 2.38 goals-against average and a .908 save percentage. His 13 career regular-season shutouts are a WBS franchise record. Thiessen spent three seasons playing at Northeastern University from 2006-09. During that time he appeared in 111 games, posting a 52-46-12 record. He was a finalist for the Hobey Baker Award (top college hockey player) following his junior season.